ECEM Demonstrator a tool to explore climate and energy data. We assist the energy industry in meeting the demand for energy while reducing harmful impacts on the natural environment, in line with international protocols, and we aim to enhance productivity and policy formulation for the energy industry through a close collaboration between the energy sector and the weather and climate community. We support the energy industry in dealing with meteorological variables. To do this, we supply and exchange improved adoption of weather, climate, and other environmental information towards more resilient, efficient and sustainable risk management practices. SECLI-FIRM invites you to be a part of a free collaboration forum. Join us for this training course to discuss applications of weather & climate information for the energy sector as a part of the Pre-ICEM Conference. 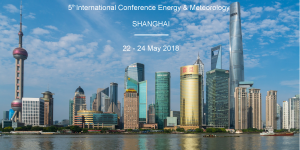 Mark your calendars for the 5th International Conference Energy & Meteorology (ICEM). Conference theme: Renewable Energy and the Environment”. The ICEM will focus on creating effective approaches for improved weather, climate and water services for energy. An exciting line-up of Chinese and International industry speakers will lead the conference’s keynote presentations, complemented by an exceptional program of parallel sessions and poster presentations!